UDM Downloads > MacX iPad DVD Ripper! 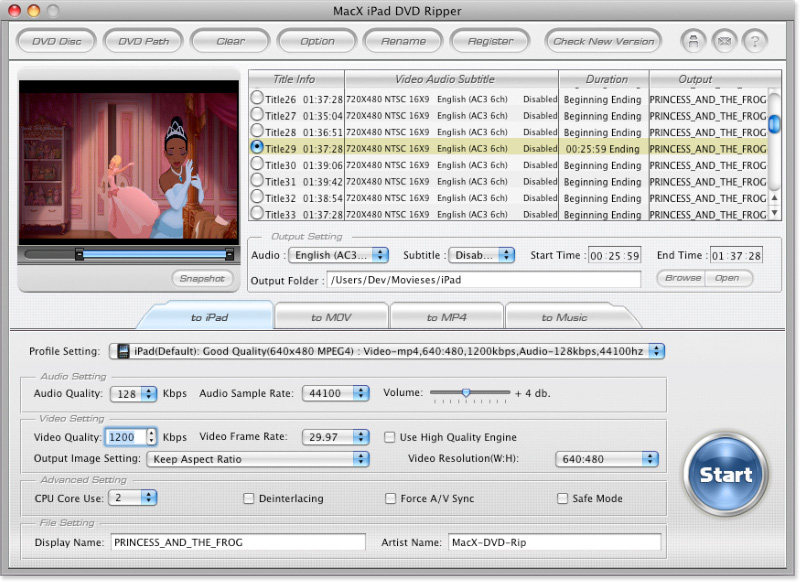 MacX iPad DVD Ripper is a powerful DVD ripping program for iPad users which features ripping any protected DVD to the new iPad (iPad 3), iPad 2, iPad in MP4, H.264, MOV, MP3 files on Mac. Professionally in DVD encryption, this DVD to iPad ripper is the best iPad DVD ripper for Mac with high ability to remove CSS protection, region 1 to 6 code protection, Sony ARccOS protection even the latest copy protection technology. Main Feature: 1. Customer-oriented iPad DVD ripper for Mac users to convert and rip DVD movies to iPad on Mac, it is fully compatible with all types of iPad including iPad Wi-Fi, iPad Wi-Fi+3G, iPad 16GB, iPad 32GB, iPad 64GB, iPad 2 even the New iPad 3. 2. One-click solution eliminates all DVD copy encryptions including normal DVD, CSS protected DVD, all DVDs through region 1 to 6, Sony ARccOS DVD even the latest copy protection DVD. 3. You are also allowed to convert DVD to MP4, H.264, MOV video files in order to playback DVD movie on QuickTime player with this DVD to iPad ripper. 4. Straightforward interface for Mac users, so it is easy to operate the whole DVD converting process in just a few clicks. 5. Easily extract audio from the original DVD to MP3 Music file that can be smoothly played on iPad, capture DVD screenshots as JPG or BMP image. 6. Supporting Multi-CPU and Hyper Threading technology, MacX iPad DVD Ripper provides you super fast converting speed, up to 8x real time. 7. Trim DVD movie to get your favorite clips or episodes from your DVD movies easily. 8. Rich adjustable parameters are provided to optimize the output quality, such as video resolution, frame rate, bit rate, sample rate etc. 9. Added a new DVD navigator analysis scheme to crack the latest encryption of newly released DVDs such as The Dictator and War Horse.